Make a sugar syrup by bringing equal quantities of water and sugar to the boil with a dash of Waitrose Kentucky Bourbon Whiskey. Simmer for 5 minutes. Add 2 peach halves per person and simmer until just soft, then remove and leave to cool. Boil the syrup for 3-4 minutes to reduce, then cool and chill thoroughly. 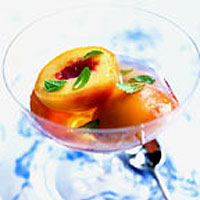 Remove the skins from the peaches and serve whole in a dish or diced in shot glasses, covered with syrup and a few fresh mint leaves.